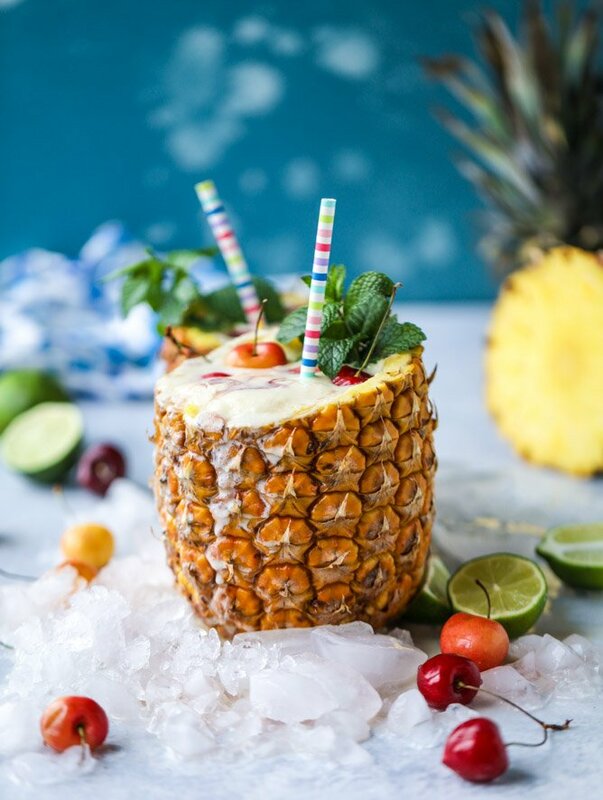 Piña Colada Mocktails! Piña Coladas without the Rum! Like really doing this! I’m showing you how I have been making a piña colada mocktail so I can drink it on the hot summer days right now. If you’re pregnant too or if you don’t consume alcohol, I think you might be suuuuper into this. We are talking frosty, coconutty pineapple goodness that tastes like you’re on a tropical island! My most favorite part of this? It’s that I swirled some syrup from a jar of Luxardo cherries into the top of the drink. Made me feel so darn fancy. Not to mention it tastes like HEAVEN. Here’s the thing. Piña coladas have been a huge thing for me. Basically all of my life. No, I mean it’s not like I was drinking them as a child. But I was so obsessed with the flavor and the scent (maybe picking it up first at an Orange Julius stop in the mall or something?) that it probably was one of the reasons coconut has always been a favorite flavor of mine. I mean we are talking piña colada EVERYTHING. I would get candles, lip gloss, body wash, shampoo, air fresheners, all that jazz. The faker the scent, the better, I’m sure. I was, like, 12. Not 22. Don’t worry. Once I actually was of legal drinking age, I wasn’t so much into the piña colada drink idea but I’m sure I ordered many just because of how pretty they looked. An umbrella! A pretty straw! A cherry swirl! As if I’m not girly enough. And! The only time I was slightly distracted from the loveliness of coconut and rum is after a few too many nights of Malibu rum in college. We actually HAD a piña colada candle in our dorm room (illegally, I might add) after all these nights of Malibu and we had to get rid of it because even unlit, the scent made us so sick. It was baaaad. You know. So glad I got past that and didn’t ruin coconut for life. Some frozen pineapple, for extra frostiness. Coconut milk AND coconut water. KEYS. We are turning the coconut water into ice cubes! Also, coconut cream, if you can! We are serious about coconut over here. Freshly squeezed lime juice! This is important. It makes it taste a lot more legit. Even if you DO drink alcohol and are in a position to do so (aka, not knocked up), you might be verrry tempted to try this and call it breakfast. Or just add the rum. Shhhh. I won’t tell. Note: to make the coconut water ice cubes, pout the coconut water in an ice cube mold the night before and freeze! To make, add the frozen pineapple, coconut water ice cubes, coconut milk, cream, pineapple juice and lime juice to a blender and blend until frosty. Serve immediately, adding a swirl of maraschino cherry syrup on top if you’d like and garnishing with fresh mint and fresh cherries. Is equally as cute in a coconut, FYI. Avocado Chocolate Mousse with Summer Fruit. How did you know this is exactly what I want? These are the cutest drinks I have ever seen. You’re awesome! I have been *craving* a pina colada for the past 3 months of my pregnancy. I’m so excited! I’m hyperventilating at how awesome these look! Straight to the top of my summer bucket list and I know just when to make them. My brother’s fiance/ soon to be sister in law is going to be visiting in town and we have plans for mocktails, so I’ll just pick up supplies for these! Yessssss! It’s reaching nearly 100 today in the DC area (depending on cloud cover), so this would be perfect. Hmmm. All I have on hand is fresh coconut meat (the kind you keep in the freezer). But I do have some left-over pineapple that I froze recently as well. I’ll see about purchasing the other components for next week. i actually made these with coconut meat (from a young coconut) first, but thought it might be too complicated so retested it and it was just as good. i really like it with the coconut though too! I just made this with the fresh (thawed) coconut meat, and it was tasty, but definitely not my feeling for a pina colado type drink. I’ll have to make it with the full fat coconut milk next go around (maybe labor day?). DEFINITELY doing this!! thanks girl! I’m ready to pop any day now, I haven’t been able to indulge in any of your delicious cocktails because I have GD… but I plan to as soon as I deliver! But… pineapples are way easier to hollow out than coconuts, and probably a lot more photogenic, too, right? This post made me laugh :). And the recipe and photos are on point. OMG where did you get those most cute straws? Eee! Also Orange Julius pina coladas were my fave c. 1995.
there straws are seriously from target like 4 years ago! Um, I may or may not have exclusively used lipsmackers piña colada flavored chapstick as a kid! Love how you’ve served this in a pineapple. I think that was my favourite way of consuming pina coladas while on vacation. I too was obsessed when I was younger – we always asked my mom to order non-alcoholic ones for us when we went out to restaurants! Thanks for sharing this recipe! This recipe looks DELISH. I want to try this recipe but I have not heard of coconut cream. Where can I find this–near heavy cream in the dairy aisle? Or is there a substitute if I can’t find it? Thanks–can’t wait to try! It’s in the baking aisle at my grocery store, near the sweetened condensed milk. So trying this! I love pineapple and coconut, but I don’t drink, so I’ve never indulged in a pina colada. For shame, I know. Did you ever have the frosted pineapple stuff from B&BW?? Back in the 1990s, I think. My favorite scent of theirs ever. Pina coladas are my favourite. I love them. Plain and simple, it’s everything about them so this is happening. Looks divine, I love the swirl you have going on! Great recipe!